I feel so proud to be able to post this, finally. (: This is what I harvested today! I’m so pleased. (: I’ll admit that I’m not the world’s most experienced gardener. 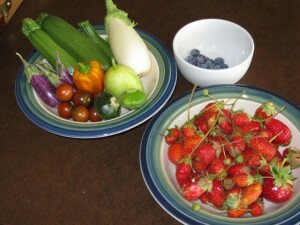 This is my first year growing everything in the veggie dish except for the cherry tomatoes. It’s my second year growing strawberries and blueberries. Cherry tomatoes … well, I’ve tried, but this is the first time that I’ve ever had them look so good and be so promising for lots of ‘matoes. I’m excited. So I took everything in the veggie bowl except for the cucumber and the cherry tomatoes (we ate the cherry tomatoes at dinner), added a few fingerling potatoes that I harvested a few days ago, and the zephyr squash, and cut them all into roughly equal pieces or left them whole. I tossed them with olive oil, salt and pepper, and put them on the grill while Uncle Pasto was cooking up some BBQ chicken — this is in preparation for Wednesday when we will be really busy. I let them cook, and pulled them off as they became ready, nice and grilled and soft-but-not-too-soft, yum. Then I chopped them into bite-sized pieces and tossed them all together. I’d been thinking about adding some more olive oil and balsamic, but I might actually not. They’re really good just as they are — the flavors are so pure. *this gets said much like this.